‘Slow and easy’ might well be the motto of MyHotels. Though it launched in 1999, the UK-based group has only just added a third hotel in Chelsea to its small stable of boutique properties in Bloomsbury and Brighton. The newcomer is an especially handsome charmer. Inspired by Chelsea’s gardens and famous annual flower show, Design Haus Liberty has infused the interiors of a well-preserved Victorian pile with a distinctive botanical mood. 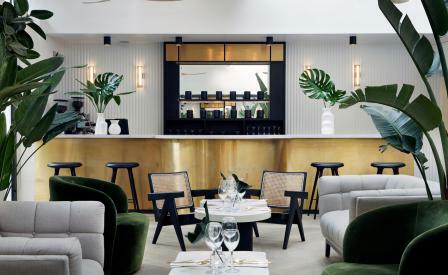 The conservatory’s white ribbed panels, white oak flooring, bronze highlights and dark low-set, almost black, furniture alongside lush tropical plants form a striking, masculine backdrop for the dark blue walls, dew-drop pendant lights, hexagonal concrete tiles and mirrors in the 51 bedrooms. The natural theme is reinforced with beehives in the rooftop garden, and a raw food menu of fresh juices, and tempting treats like a tiramisu cheesecake that is vegan, gluten and sugar-free. An LMS Wellness outpost, meanwhile, delivers facials and massages.